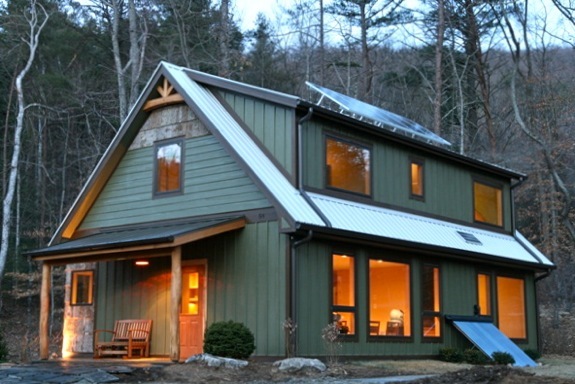 This passive solar home combines active and passive solar building techniques. Constructed with SIPs (Structured Insulated Panels) it boasts a HERS rating of 47, making it an efficient home with a tightly insulated envelope. The custom home features artistic water drains. Two different, but similar homes were submitted for this article. Both were designed and built by Brian Knight and his company Springtime Homes of Asheville, North Carolina. The homes are 1430 and 1544 sq. feet. One cost $198,700 while the other was $239,320. As a testament to the desire of consumers to have an efficient homes, both have already sold. Custom built homes tend to have more artistic, whimsical features and are often more solidly built. 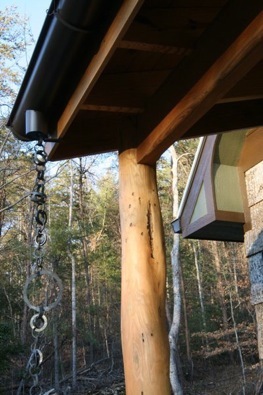 The porch is supported by logs shaped by hand, with an metalic rain drain off to the side. The homes also have classic passive solar design. Most of the windows are on the southern facing side of the structure and the roof incorporates a small overhang that blocks the summer sun’s heat from entering the home. The home has a ratio of 10% southern facing glass to square foot of thermal mass. Concrete floors, the heat absorbing material with thermal mass, were poured on the lower floor. 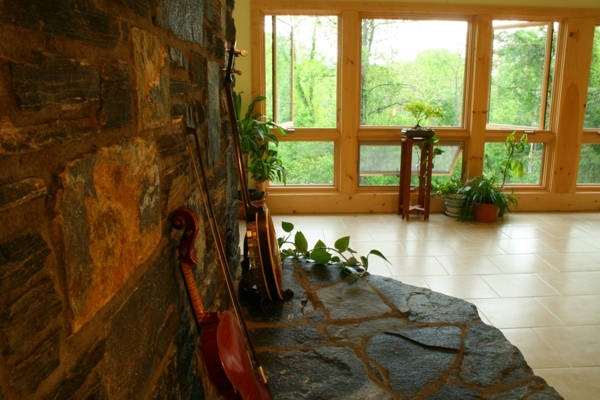 The tiled front room serves as an area with thermal mass on the southern facing side of the house. Photo from other one of Brian’s building project. Because windows on the other non-south facing sides of the home were minimized, they incorporated the used of triple glazed windows on them to help minimize heat loss and keep the home well insulated. They used both fixed and operable windows. The use of fixed windows often reduces the overall cost of the window, while it also cuts down on air infiltration and thermal bridging. Because some of the windows are operable, air flow through the house can be created when desired. The south wall of the home was also designed with areas of solid, windowless areas to avoid over-engineering the build. SIPs were used in the construction of the passive solar homes. In order to build a tight housing envelope, Polyurethane SIPs from Eco-Panels were used. SIPs are constructed off site, to the builder’s specifications. They are structurally very strong and each panel is a continuous slab of insulation. 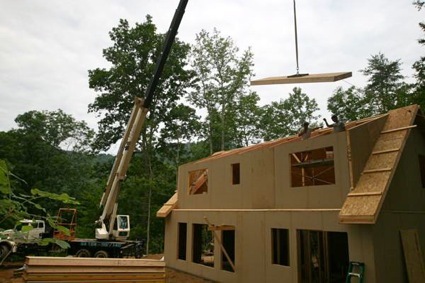 As can be seen in the photo, SIPs are preconstructed panels that can quickly be put into place in a matter or days. The type of insulation used in a SIP can vary and can include styrene, polyurethane or even straw. Polyurethane SIPs are said to have twice the R-value of a styrene, and thus reduces the potential for thermal bridging (the ability for cold or heat to move between and across surfaces). The south side of the home also has solar evacuated tubes to help heat the house. There is a 1 KW solar panel on the roof to supply the grid-tied home with electricity. There is a smaller PV panel on the lower roof located above the thermal tubes that is dedicated to the El-Sid DC pump which circulates the glycol anti-freeze mixture in the evacuated solar thermal tubes. Lots of advantages for this. It’s been proven that circulation pumps attached to a home’s AC power supply are HUGE parasitic loads which reduce the payback time of SHW by many years. It simplifies the installation and reduces commissioning problems because a separate controller (and thermistors, wires) are not required to tell the pump when to turn on and shut off. If the sun is bright enough to heat the water, it’s also providing enough power to circulate the fluid so it’s more of a passive system. DC pumps, especially the EL-Sid are known to have a much longer life than AC pumps. The home is on city water so if there is a power outage, the home will still have warm water if the sun is out. 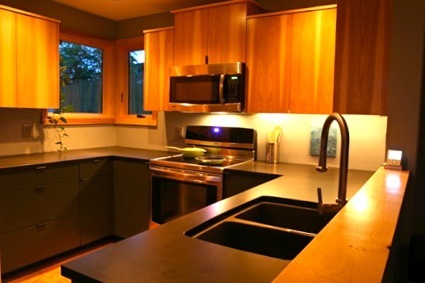 A view inside of the kitchen of the passive solar home. Our society has become accustomed to having the luxuries of hot water and heated homes, yet as energy demands on grids rise, is has become more commonplace to have power outages due to too much demand or from weather wreaking havoc on power lines. Homes that have solar-based backup systems installed will have these luxuries even when the electrical grid system fails. These systems simply need to be built with other aspects to help them function efficiently. 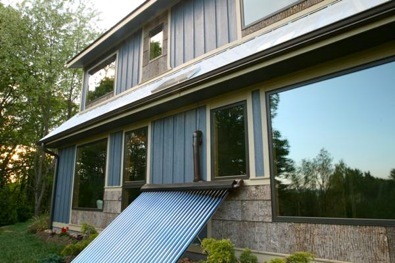 Every home that uses solar thermal tubes will have something known as the heat dump. This is the place where, if the system has more heat than is required by its settings, the heat dump is the location where the excess heat is discharged. Sometimes it is a place like a garage that is not a conditioned living space as in this other build, but in this home it is located next to the storage tank directly behind the collector under the stairs. It is impressive and encouraging to learn about efficient passive/active solar homes being built around the country. The photos were all courtesy of Brian Knight. He designed and contracted to build the homes. He is also available to consult on energy efficient building projects. Learn more about his company by visiting his website accessible below. 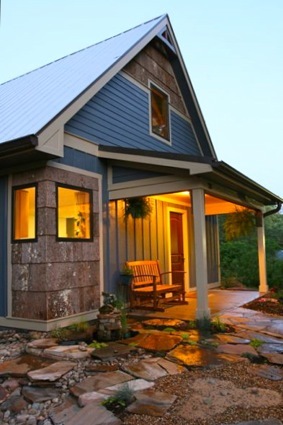 Springtime Homes is a custom home building company based out of Asheville, North Carolina. Thanks for the great article Keya. Just wanted to touch on a technical detail of the SIPs. While polyurethane foam gets most of its advantage over sytrene by its better R valu,e its not necessarily this aspect that reduces its thermal bridging. Polyurethane foam panels are made in a different manner than polystyrene. They are made from forms as opposed to glued together. The companies like to point out that this can result in greater strength but it also reduces the thermal bridging as long as they are removing the 2x forms at the edges and using an appropriate attachment. Eco-panels and another company I know of use a cam lock type system similar to walk in coolers for the edge connection of wall panels. Eco-panels also has a patent on a continuous corner panel with no 2x bridging whatsoever. Its minor in the grand scheme of things but could make the difference in a passive house type project. Foam haters should be aware that the big Global Warming Potential is about to be addressed with the introduction of new blowing agents to the foam industry. Are there other projected homes to be built in the Asheville area? Did these owners already have the lot to build on? I just pinged Brian from Asheville’s Springtime Builders to see if he can respond to your question. Hi Jan, thanks for the question. I consulted with the owners as they were buying the lot. It can be helpful involving builders and designers in site selection, especially with passive solar design. Feel free to get in touch through our website and thanks for the good research! I realize this blog and string are older – but am going to give it a try. I have just moved to Saint George Utah and would love to know if there is a builder such as Springtime using their building methods some where closer to me. I have long watched the development of this method and would love to put is to use in a house here. St. George is a sunny location where passive solar would work well. I’m happy to report that there are passive solar resources there. These homes were built there, so the builders and knowledge is there. https://www.builditsolar.com/Projects/SolarHomes/SunSavvy/Overview.htm While Sun Savvy no longer has a website up, ask around, and you should be able to start finding other passive solar resources there. Best of luck!